A few days back, I was called by the residents of a neighboring colony because they had Brahmakamals [the lotus of lord Brahma] blooming after 5 years! Those flowers bloom at night; I was called to photograph them. I went there and took many photos, one of which is showcased below. After a few days, there was a clarification in a local newspaper that the flower thought to be Brahmakamal was actually a weed flower! :) Real Brahmakamals are native to Himalay and cannot bloom in any other environment; Brahmakamals look like cabbages. Update: I have received an email from someone who would like information to be published anonymously. She says that the name of this flower is Keng Fa, and that it is considered a king amongst flowers in some South East Asia. She has mentioned that the flowers are very fragrant, and that the plant blooms with flowers 3-4 times during a year with life of each flower lasting for only one night — Keng Fa blooms in the evening and last only until morning! 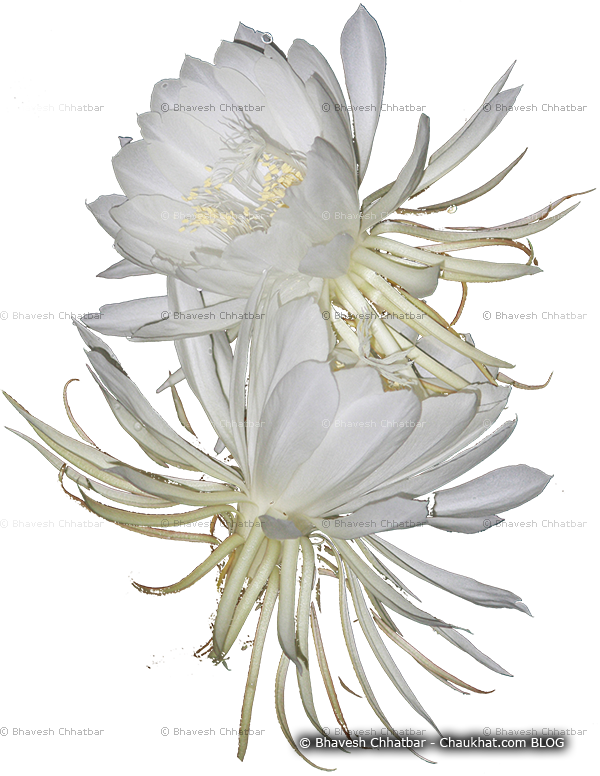 After receiving her note, I searched on Google about this flower and found that it is known as Keng Huay, Broad-Leaf Epiphyllum and Epiphyllum Orchid Cactus also. Well it may be a weed, but it is certainly a beautiful one! After five years... Wow, what a treat to get to see something like that! Perhaps the most beautiful weed flower ever! It deserves a better name! @ Holly, the Old Western Gal: We had the same reaction when we realized that it's a weed flower! @ blog with no name: Yes, right Michael :) It was a huge exclamation! it might be a weed, but its beautiful!!! I tell you, for a weed, it is exquisitely beautiful! @ Nishant: That's quite a needed input Nishant. Cool to find out that it's a Nightblooming Cereus! While writing on to your blog, there is one flower getting blossom on our plant.